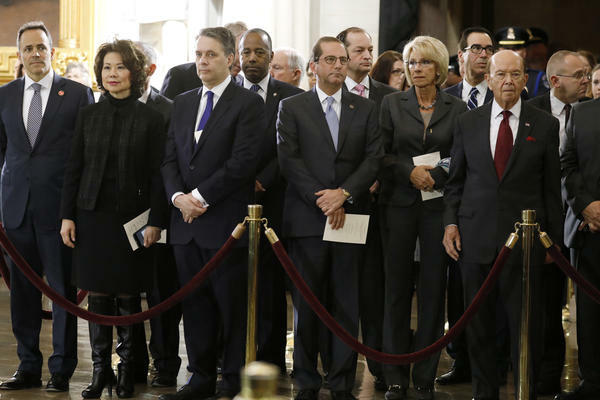 Trump administration Cabinet secretaries attend ceremonies for late evangelist Billy Graham at the U.S. Capitol on Feb. 28. At least nine current and former members of the Cabinet face accusations of abusing their office. "On Secretary Carson, the order that you referenced was canceled, and they're looking for another option that's much more responsible with taxpayer dollars," White House press secretary Sarah Huckabee Sanders told a reporter at the briefing Friday, offering a halfhearted defense of Carson. At least seven current and former officials in Trump's 24-member Cabinet have faced accusations of abusing the perks of their office. Tom Price, the former head of the Department of Health and Human Services, lost his job after it was revealed that he took charter flights costing nearly half a million dollars. "I was disappointed, because I didn't like it, cosmetically or otherwise," Trump told reporters last September, the day the firing was announced. But ethics problems like this actually aren't so rare. "I happen to have a list of administrative scandals going back to Harry Truman, and I can tell you this is really not new," Elizabeth Sanders, a political scientist at Cornell University (and no relation to the press secretary) said in an interview with NPR. "Is Trump worse than others?" she asked. "I think he's different, because the scandals are more related to the incompetence and venality, one might say, of people that he brought in." Sanders cited Ronald Reagan, who, like Trump, brought in a cohort of outsiders to shrink government. But after a few scandals like those happening now, Reagan changed his approach to hiring, she said. "He appointed people who were not only competent but who had experience and who didn't have personal interest in conflict with the agencies they were heading." One common thread of these current scandals is a sense of privilege. Federal officials are supposed to fly coach whenever possible — not first class and certainly not charter. They're not allowed to bill the government for pleasure trips, as Shulkin tried to do. He has made some repayments. HHS said Price's charter flights were needed because of his "demanding schedule," which included speeches to doctors groups, visits to medical facilities and a stop in Nashville, Tenn., where he met his son for lunch. Price later offered to reimburse the government for the cost of his seat — $51,887 — but not for the overall cost of the flights themselves. He said, "The taxpayers won't pay a dime for my seat on those planes." Interior Secretary Ryan Zinke used helicopters to avoid Washington's notorious traffic. In one case, he took a helicopter to Yorktown, Va., to visit the battlefield, which is maintained by the National Park Service, and then flew back to go horseback riding with Vice President Mike Pence. This leads to the other common thread: a tendency to blame the staff. When details of Zinke's travel became public, he told the Heritage Foundation that his charter flights "were only booked after extensive due diligence by the career professionals in the department's general law and ethics division." Similarly, Scott Pruitt, administrator of the Environmental Protection Agency, said started flying first class after encountering hostility from other coach-class passengers. On CBS's podcast The Takeout, he said his security officers told him to do it. "I have a responsibility to listen to those individuals that are charged with the obligation to keep me safe and to keep employees at the agency safe," he said. The day before Tom Price was fired as HHS secretary, he told Fox News all of his trips "had been approved by the legal department, and been approved by the administration department — within HHS." And the way Treasury Secretary Steven Mnuchin explained it, his request for a military plane for his European honeymoon actually came from his staff. "They put in a request to consider the use of an aircraft — not so much just for flying, but effectively it was a portable office," he told Politico. Ethics consultant Susan Liautaud said the cabinet officials might have misjudged the public's tolerance. She told NPR, "I'm wondering if some of them aren't a bit surprised by the very strong reaction from the media and the public." Liautaud said poor ethical conduct is highly contagious within an organization, and added, "The more dangerous part is that not only does unethical behavior spread, but it mutates into other forms of unethical behavior." She said what starts out as a simple transgression can lead to doctoring emails, or lying to investigators, or threatening whistleblowers — all hallmarks of the travel and spending cases now under scrutiny.